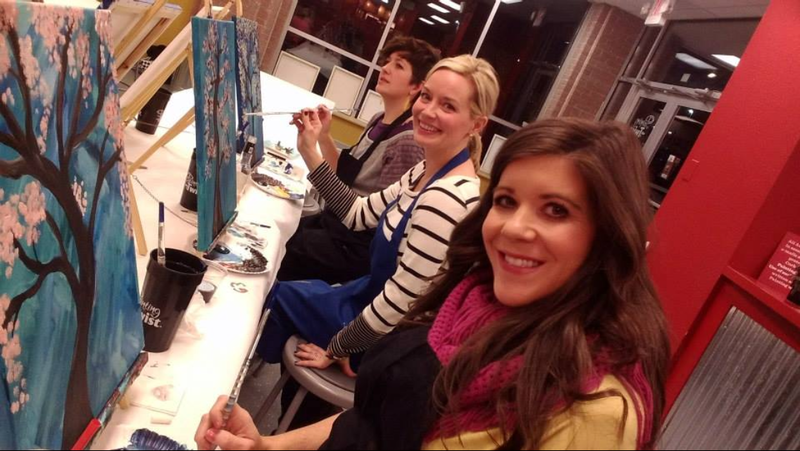 Last week my neighborhood had a ladies night at Painting with a Twist. We do ladies nights every month or two and we usually meet up at someones house in the neighborhood. 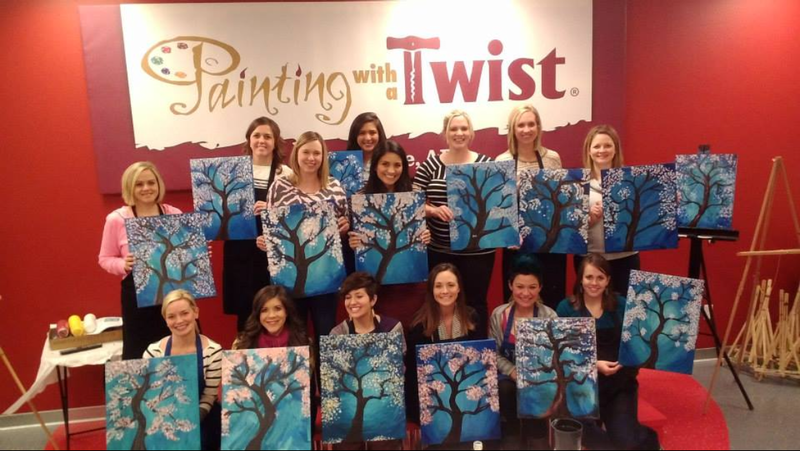 However, this time we mixed it up and decided to get together at Painting with a Twist. 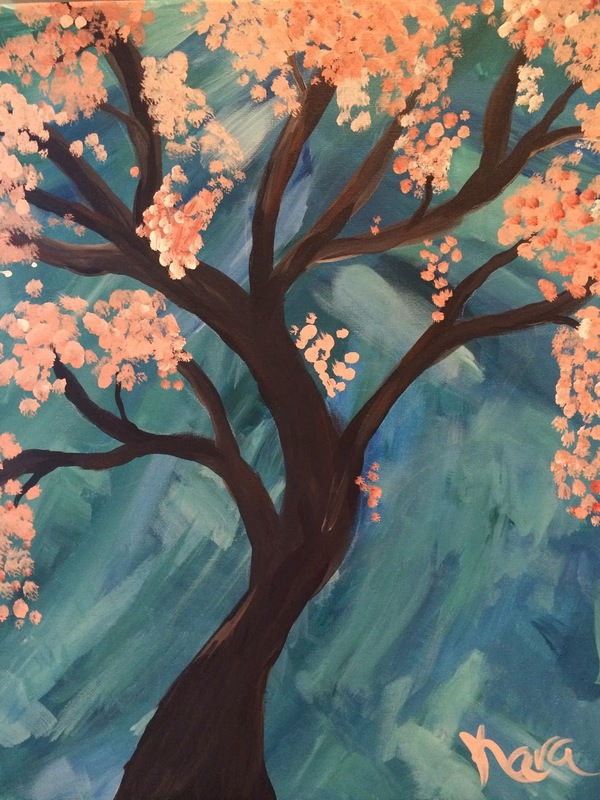 I knew I would have fun with my neighborhood friends because I always do but I was worried about painting because I am as far from artistic as can be. I still decided to go and figured we could all get a good laugh at my painting when it was all said and done. We picked a tree to draw and when we arrived everyone had a blank canvas propped up on an easel with a couple of different paint colors on a paper plate. The instructor told us to start with the background so we mixed some colors together to get the blue backdrop. Once that dried she had us draw out a tree with chalk so that we could easily make changes to it if we needed to. After that we painted the tree then simply dotted the leaves onto it to finish it off. Like I said, I absolutely cannot draw or paint (I don't even have good handwriting) but I was actually pretty proud of my little tree!! When I brought it home Scott couldn't believe I painted this all by myself. I think this painting is one of their more simple ones but who cares! I don't really have anywhere to display it but I'll definitely always hang onto it since it didn't end up being a total mess like I thought it would! We all had so much fun at Painting With a Twist. It made for a really great girls night and I highly suggest you do it if you have one in your area! We all said we would have to go back and do it again soon. this makes me smile, good job! I have nothing left to teach you....unless you are willing to take a handwriting class. I was hoping you would be proud of me! !